Designing Schools for the ‘Whole Child’ : Built Pedagogy for Diverse Learners | Snyder | transformative design. controlled outcome. This month we looked at K12 design strategies that improve the cognitive function and performance of students in the digital age. Built pedagogy not only supports students, but enhances the cognitive abilities of the teachers and staff who inspire them. We as architects can design high performance school buildings that nurture multiple intelligences. The following design elements have been proven to advance the cognitive function and achievements of students. Increased natural light for reduced glare and increased views of nature. Quality lighting, task lighting and placement. Materials reduction or elimination of toxic chemicals in construction and fitments. Ventilation provides clean fresh air. The school layout and adjacency of program spaces are a reflection of the school’s educational philosophy. Does the school uphold the traditional hierarchy of subjects or does it encourage multiple intelligences? At Jean Vanier Catholic Secondary School, the mission was to design for multiple pathways to success. 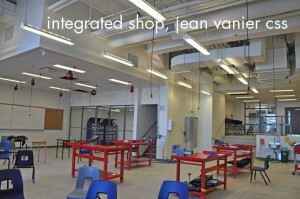 An integrated shop off the atrium showcases inquiry driven project-based learning front and centre. 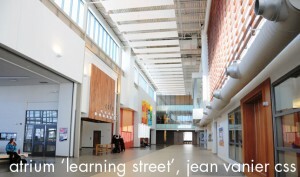 A public scale theatre and art gallery also take centre stage off the atrium or ‘learning street’. 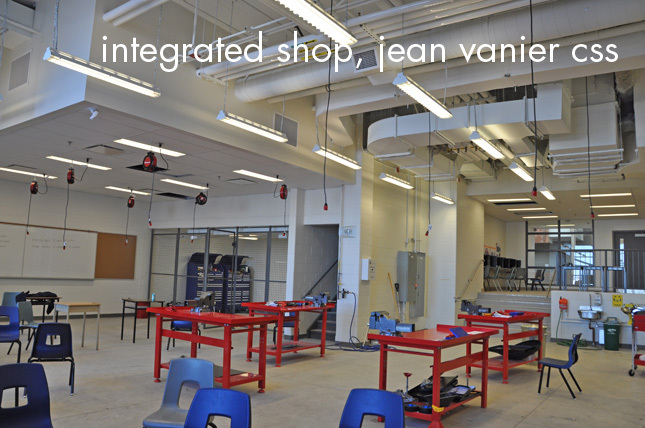 Adjacent to the integrated shop is an outdoor projects courtyard with a steel structure where students can build HVACs, cultivate a horticultural garden or learn in the ‘campfire’ style in the outdoor stepped classroom. The stair landings at Jean Vanier are wide open spaces with abundant views outdoors to support peer to peer interaction and the development of soft skills. We avoided horror-dors and instead opted for wide open corridors full of light and spirit with break-away spaces where students can pause, reflect and connect. 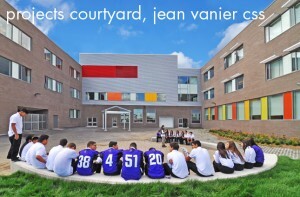 The atrium opens onto a soaring cafeteria that accesses a front outdoor patio — a hive of school culture and student life. The Learning Commons on the second floor overlooks the atrium through a great wall of glass. Many nooks and break-away spaces for pause and reflection. Student lounge for independent learning.